Crafty Bikyclist: Yes, I am a crazy cat lady. 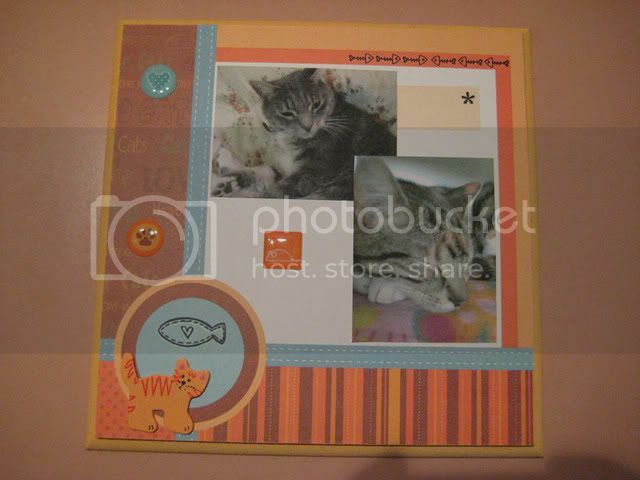 I found these scrapbook kits at The Reject Shop, $2 for a collection of 6 backgrounds, stickers and transfers all with a cat theme... so I had to make one. The phots are awful quality cos they were taken on my really ancient phone camera and then printed using my regular old printer. But I still like the finished effect overall. Paper stuck to a plywood board from Spotlight, basic kit from the Reject Shop and a wooden cat figurine from somewhere, I can't remember!